Project Execution and Monitoring: Getting the Work Done! Project Planning: Will the Project Create Value? The overall goal of the execution and monitoring phase of the project is to get the work done. This is the longest phase of the project. The execution and monitoring phase of a project typically takes several months and can even take several years to complete. If a meeting is not possible, then a conference call or email could be used to introduce the project to the project team. This should be self-explanatory. Any work packages, which could be started now, need to be distributed to the project team for them to work on. Again, fairly obvious. The team works on the work packages that they have been given to do. One of the main tasks that the project manager has to do is to monitor the progress of the project. The main areas to be checked are Time, Budget, Quality, and Risk. Time Are the work packages completing on time? Budget Is there still enough money available to the project for the open work to be completed? Quality Is the project team able to deliver the expected level of quality? Risk Can any of the risks be closed because they are no longer relevant? Have any new risks been discovered that need to be accounted for? The purpose of the monitoring task above is to find any issues or problems, which the project team may have. Clearly, it is not enough to find the problems or issues. The expectation is, that an action will be planned to solve it as well! Any changes, which need to be made to the project, either because the project team has found a problem or a better way of doing things, will need to be planned. 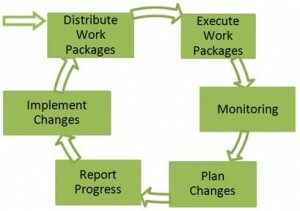 The steps for planning a change are similar to the steps taken during the project planning phase. Normally, there is no need to replan the whole project, just the part of the project affected by the change. The reason that progress reporting comes after change planning, is that the project manager will need to agree the changes with the project sponsor. Progress reporting is a good time to get the support of the project sponsor for the change. The project manager can explain the current status, describe the planned change and expected improvement. The project sponsor is then in a good position to make a decision on the change request. The agreed changes can now be implemented by the project team. Once all the work packages have been completed, the project will move automatically into the closing phase of the project. Copyright © 2019 EPM. All rights reserved.